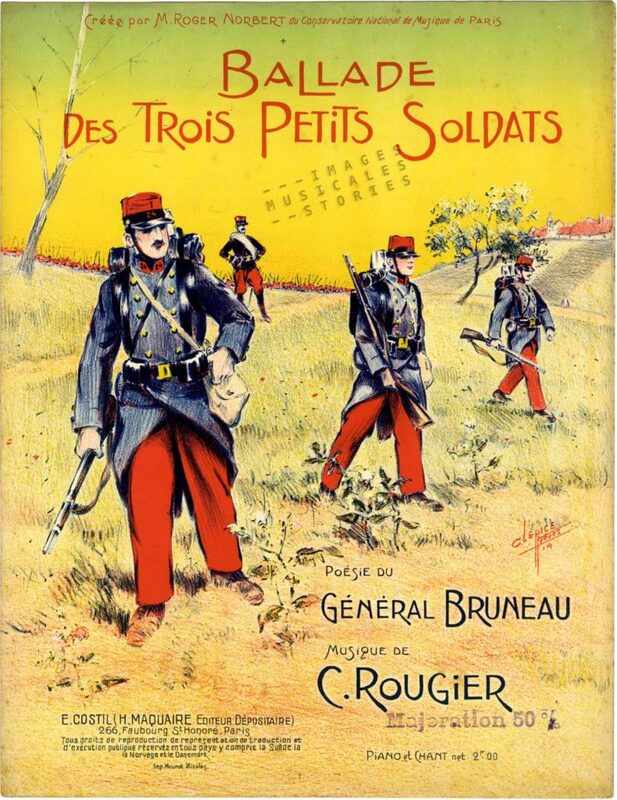 ‘Ballade des Trois Petites Soldats‘ by C. Rougier and Général Bruneau, published by Costil (Paris, 1914) and illustrated by Clérice Frères. On this cover from 1914 three French soldiers are ready to serve their country. Despite their young age they bravely march in bright-coloured uniforms. All three seem unaware of being flamboyant targets for enemy fire. Before WWI, the French army had good reasons for choosing a flashy outfit. The stylish uniforms made the soldiers proud and heightened a sense of camaraderie, notably by the elite who made up a large percentage of the military. Also, commanders could easily oversee the battlefield and armies. Moreover, close-quarter fighting didn’t require camouflage: when the smoke of the black powder made recognition difficult, a soldier with a striking uniform was able to stand out from his enemy. ‘Défilé des Enfants de troupe‘ by Désiré Piérard, published by Andrieu (Paris, s.d.) 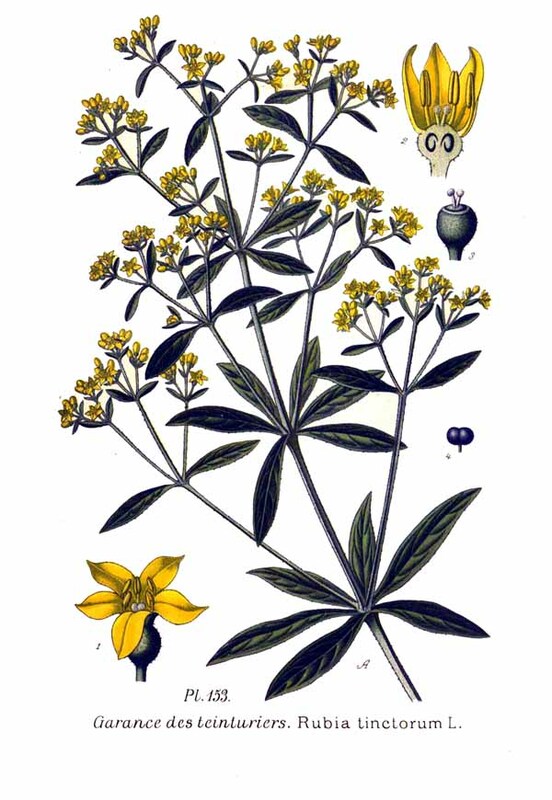 and illustrated by Clérice Frères. 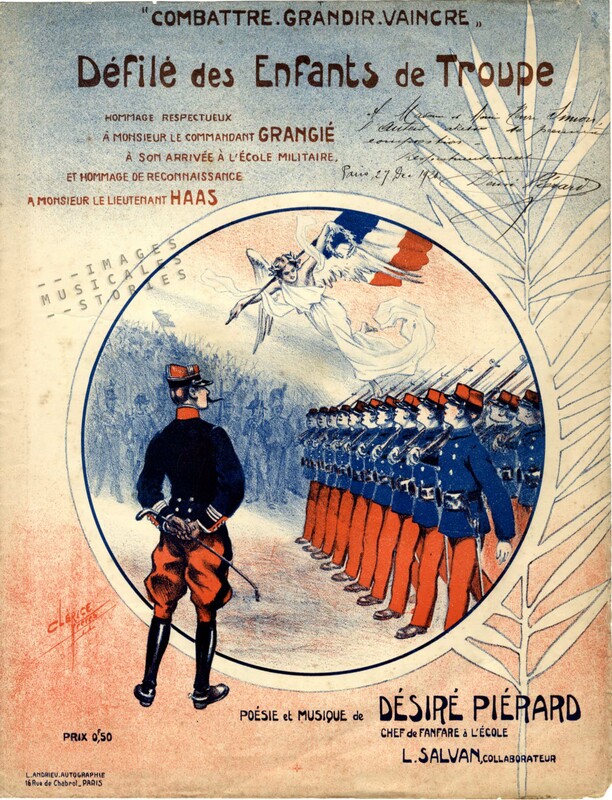 In 1914, the typical French uniform with its red pants and kepi and blue coat was almost a century old. It was in 1829 that king Charles X had ordered the use of the colour red for military uniforms, in order to revive the French culture of the garance des teinturiers or dyer’s madder. The dye was obtained from the roots of Rubia Tinctorum that, mixed with chemicals, resulted in a rich red colour. In France, garance was mainly cultivated in the Vaucluse. From 1860 on, overexploited land and a decline in quality adversely affected the culture of garance. In the late 19th century the natural dye had to compete with the production of synthetic red colouring by the Badische Anilin und Soda Fabrik (BASF). This all led to the end of the French manufacturing of garance. From then on —quite ironically— German synthetic red was used for the French uniforms. In the decades prior to the Great War most countries decided to abandon the bright uniforms. They reasoned that soldiers should blend into the landscape and therefore changed their outfits to shades of khaki or Feldgrau. 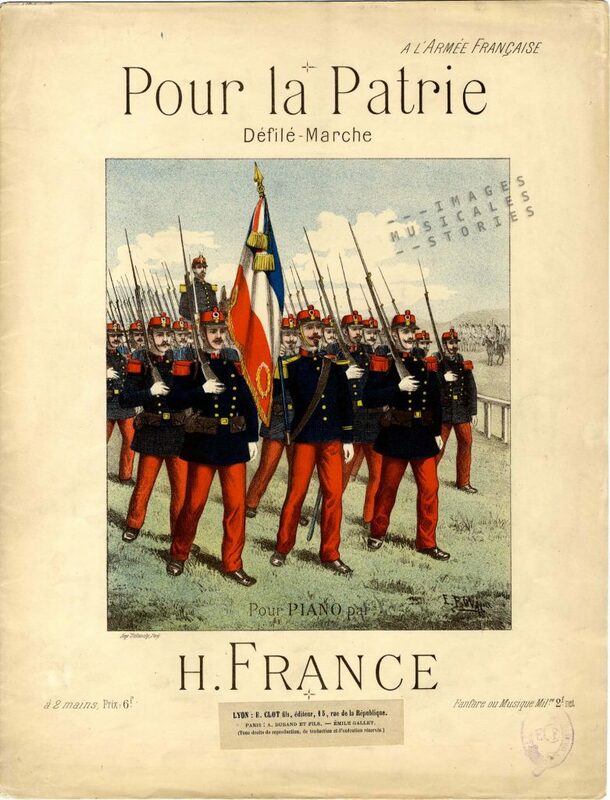 ‘Pour la Patrie‘ by H. France, published by Etienne Rey (Lyon, s.d.) and illustrated by E. Buval. Even the minister of war exclaimed: “Remove the red pants? No! The red pants are la France”. It wasn’t until 1914 that the French agreed on more discreet outfits. But that was too late. The French soldiers had to start WWI in an obsolete and for that time ridiculous uniform. In 1915 the change in outfit became effective: the trousers became grey blue, and the bleu horizon uniforms were born. ‘Bleu horizon‘ refers to the indefinable colour that separates the sky from the earth. 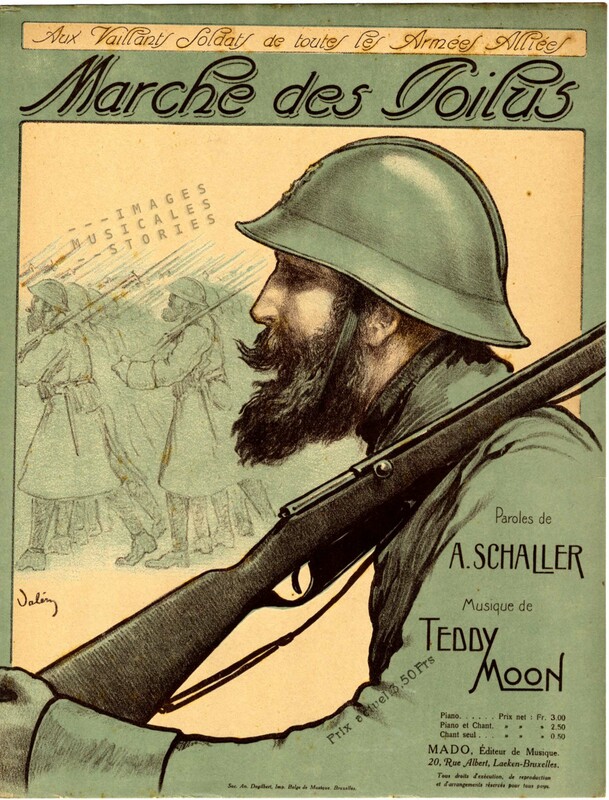 ‘Marche des Poilus‘ by Teddy Moon & A. Schaller, published by Mado (Brussels, 1919) and illustrated by V. Valéry. 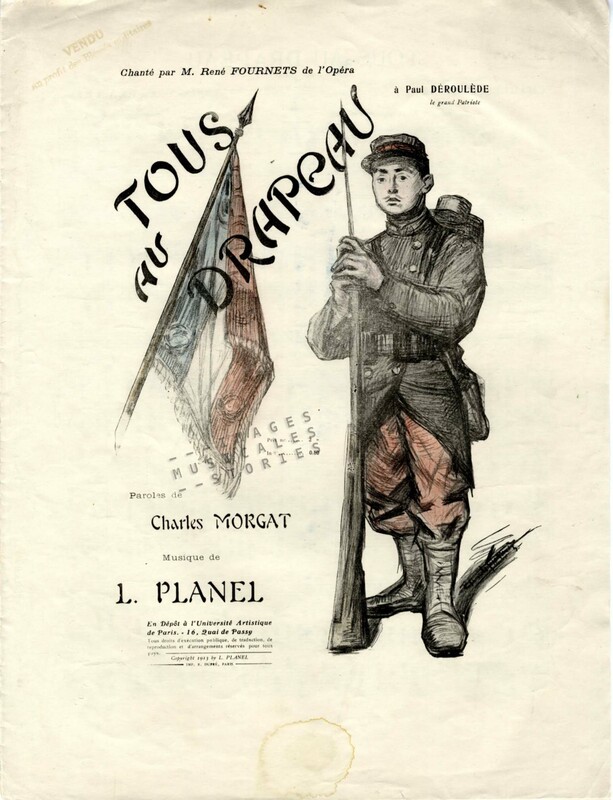 It was General Jean-Paul Bruneau (1848-1922) who wrote the lyrics of the Ballade des Trois Petits Soldats which introduced our story. The general disliked the new uniform and preferred the pomp of the ancient one, which rightly emphasised the French fighting spirit. In his words: the Gallic Rooster does not need a helmet to roll over the enemy; he rather dons a kepi the colour of blood! Car il ne nous plaît pas d’être couleur de crotte. Pour braver la mitraille et battre l’ennemi. Teint du sang de son cœur, à cette camelote ! 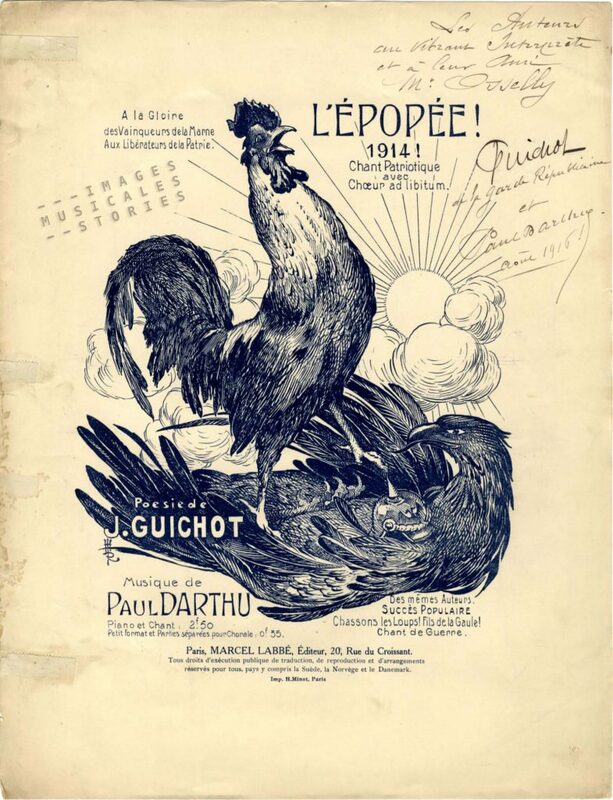 ‘L’épopée‘ by Paul Darthu & J. Guichot, published by Marcel Labbé (Paris, 1914) and illustrated by Henri Royet. Garance is a colour, but it is also a movie icon. In the next trailer for the restored movie Les Enfants du Paradis (1945) we see Arletty playing Garance, an ethereal woman romantically pursued by four different suitors. The short extracts remind us of her particular voice. But we can also see a glimpse of what was once the lively Boulevard du Temple, subject of a previous post.